Solar PV system prices have hit all-time lows in Australia, according to Solar Choice’s team of Solar Energy Brokers. These solar price declines are due to a perfect storm of factors, including the strong Australian dollar, increased competition amongst installers and manufacturers due to withdrawn subsidies, and a flood of cheap solar system components from China, resulting in a global glut of solar PV system component supply. The price of solar systems has most likely ‘bottomed out’, and is expected to begin rising again over the next 3-6 months, as Chinese panel manufacturers close factories and global supply catches up with demand. Solar Choice, as Australia’s Solar Energy Brokerage service, manages a network of over 70 installers Australia-wide, representing a broad cross-section of the solar PV installer market. This puts the company in a unique position with a ‘bird’s eye view’ of the industry and and its trends, including which components are used regularly, which ones are in greatest demand, and the cost of completed installations after the Federal Solar Credits rebate. According to the Solar Choice team, prices for most systems have dropped significantly since around June of 2011. The price drop followed the announcement of a reduction of the Federal solar power incentive, as well as the total withdrawal of the NSW Solar Bonus scheme, the program which drove NSW to become the largest solar PV market in the country. A number of solar industry trends have made themselves evident over the past year or so. The most obvious set of changes has been the steady withdrawal of solar PV incentives, which have been slashed across the board, both on the Federal and State levels. Earlier in the year, New South Wales and Western Australia scrapped their subsidisation schemes for small-scale solar PV. Similarly, Victoria and South Australia have recently reduced their small-scale solar subsidies significantly. The ACT has switched to a one-for-one tariff from a set rate. This makes Queensland the only state that still offers its original solar feed-in tariff rate. In addition to State-level cuts, Federal incentives have taken two major knocks–a sharp drop in the REC/STC price from $40 to as low as $16 (currently around $30) and a reduction of the REC multiplier, which incentivised small-scale solar systems. 1kW and 1.5kW systems were once the staple installation sizes for residential customers. “At one point in time, the average market price for a 1.5kW system was $2 -$3 thousand ($1.33 – $2.00/watt), after RECs [STCs],” said a member of Solar Choice brokerage the team. Following the cuts in the Solar Credits scheme and the drop in STC prices the cost of smaller solar systems jumped temporarily, to an average of $3 – $5 thousand. Prices have since recovered, however, with systems coming in at as low as $1700 [$1.30/watt]. The phenomenon of price decline observable even in unsubsidised solar PV prices. 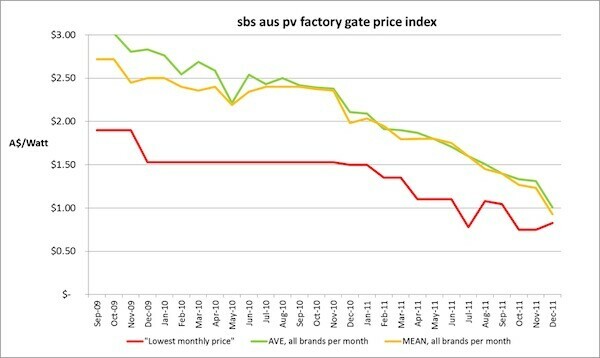 Solar Choice’s data are corroborated by research undertaken by Solar Business Services director Nigel Morris, who has been tracking solar panel factory gate prices since September 2009. According to his figures, the average cost per watt of solar panels (not including balance of system (BOS) components such as inverters and wiring) has fallen from about $2.75 to less than $1.00 since he began keeping records (see graph below). Why are solar system prices so low? The brokers attribute the drop in prices at least partially to the withdrawal of the subsidies that had been driving the industry and the stiff competition that ensued. “It’s turned into a buyer’s market. The market had been saturated with the subsidies in place, but once the work dried up, installers had to go looking for new customers,” said Chapman. This competition has also resulted in a major shift in the components used by solar installers; installers who would at one point in time only offer high-end products have now also taken onboard less costly, lower-end components for their installations in order to remain competitive. Thanks to substantial Chinese government subsidisation (which has recently been the flashpoint in a trade row between US and Chinese solar PV manufacturers), a flood of cheap Chinese-made panels has also made its way onto the Australian market, bringing down the average price of systems significantly. Recharge Magazine recently estimated that global capacity for solar panels is currently approximately 41GW per year, whereas demand is only 28GW–a massive difference of 13GW. There are literally hundreds of solar PV panel manufacturers in China, most of which are expected to fold in the next 5 years, and 50% of whom have reportedly already ceased production, according to a recent report from Digitimes Research, which quotes the Chinese-language Guanzhou Daily. (Competition from Chinese installers was one of the reasons cited when Australia’s only solar panel manufacturer Silex Solar announced that it would close its Sydney assembly plant.) Once the Chinese manufacturer market slims down–and as China’s domestic demand for solar increases–decreased competition and elimination of the lower quality panels from the Australian market could mean a rise in the average cost per watt. The supply of as-of-yet uninstalled solar panel stock globally was approximately 10 gigawatts (GW) at the beginning of the year, according to Morris of Solar Business Services. This glut, like the increased competition, has arisen at least partially due to the withdrawal support schemes abroad. A drop in global demand has resulted in manufacturers selling components at slim margins or at losses, and often to Australia, just to keep inventory and cash flowing. Calculations by Morris estimate that the excess stock now sits at around 6GW. This number is still significant enough to drive down prices. The situation is temporary, however, and Morris expects that Australian prices have either already levelled out, will level out, or will begin to rise again in 3-6 months. Underpinning all of the above is the strong Australian dollar, which has enabled the country’s solar industry to import solar PV system components at affordable prices (and is also ironically accused of being a major factor in Silex’s woes). Historically the exchange rate has fluctuated significantly, and it is not expected to maintain its current high indefinitely. A weakened Australian dollar, once the current oversupply of solar component stock has been exhausted, will mean that new components will have to be purchased at higher cost, which will be passed on to end users. How long will solar PV system prices remain low? It is difficult to say how long solar system prices will stay at their current levels, but the factors above indicate that the solar installation market is in a temporary ‘sweet spot’, from which it will inevitably dislodge itself–at least for the interim. Payback periods, which based on the current prices available are approximately 5-7 years in states with no or small feed-in tariff incentives, would grow longer with an increase in solar system purchase price, although this may be offset to some degree by the rising price of electricity in Australia. A solar power system is an investment whose value increases with the price of retail electricity, provided the power it produces is used directly by the home. Although it is true that the cost of solar PV systems has been declining rapidly, and that the primary consideration for many who are considering going solar is the up-front cost, it is very important to to carefully consider which components are included in a system. Purchasing a solar system is a decision that a household will only make once, so the longevity and bankability of its components are factors that should should be cautiously weighed against costs by anyone in the market for a system. Looking into the long-term future, solar PV will continue to grow and is expected to become an increasingly important part of the world’s energy framework. Even the International Energy Agency (IEA) has speculated that 60% of the world’s energy could be sourced from solar power (both solar PV and concentrating solar power) by the year 2060. Solar Choice provides advice on component selection and general advice on solar PV system design to customers, and acts as an independent and impartial mediator between the installers in our network and our customers–we do not push any installer or product. We have undertaken due diligence in the selection of all of our installers to ensure their dependability, experience, and professionalism. Previous post: How much do solar PV systems cost in Townsville, Queensland? Next post: How much do solar PV systems cost in Mackay, Queensland?